What kind thing have you done today? I can remember a wonderful November morning several years ago at my son's elementary school. I had just taken him into the special education room where he started each morning. The teacher and aides were talking about how much my son and the other students had enjoyed some chocolate donuts that they had been given for a snack the week before. I chatted with them for a few minutes and then left. As I walked through the parking lot, however, a wonderful, kind thought came into my mind. I always try to follow such thoughts, too, because I learned long ago that any thought full of love and kindness usually comes right from God. Wrapping my winter coat around me, I then headed straight for the local grocery store and bought two boxes of donuts — one for my son and his friends and the other for the teacher and aides that always took care of them with so much love, kindness, and compassion. Hurrying back, I was able to deliver my simple gift before the start of school. The smiles on the faces I saw paid me back a hundred times over and I walked out of the classroom smiling to myself with a warmer heart and a lighter soul. I had paid little in the way of time or money, but that act of kindness had purchased more joy, goodness, and delight than I could have ever dreamed possible. A little act of kindness goes a long way. A little act of kindness goes a long way towards making this world a better place. Each kind thing we do connects us to the hearts, souls, and lives of those around us. Each kind word we say and kind thought we think brings us closer to love, closer to each other, and most importantly, closer to God. Kindness always ripples out as well and travels from person to person until it returns home to the heart that first shared it. © Joseph Mazzella. This article originally appeared in the Just a Minute inspirational email, and is reprinted here with their kind permission. 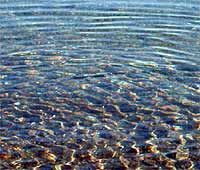 "Ripples of Kindness" by Joseph Mazella is licensed under a Creative Commons License. Heartlight encourages you to share this material with others in church bulletins, personal emails, and other non-commercial uses. Please see our Usage Guidelines for more information.